The women being mostly illiterate produce handicrafts with local materials during free time between household activities, to supplement their marginal family income contributing towards a better living condition. We promote and market the products in abroad to create this much-needed employment at home and to ensure a decent return for their labour, free from exploitation. This independent earning, however small, belongs to the women themselves and gives them a place of respect at home and in the society. 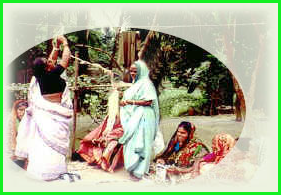 CORR-The Jute Works provides Group Development Fund for producer groups to establish the income generating activities among the groups. The group has to manage and use this fund for continuity to benefit the group. The Education Sector of the Jute Works monitors the records for ensuring appropriate use of this fund by the groups. Thus, the groups are learning to handle and administer funds. The groups use this fund mainly to procure raw materials in season, which benefits all the members. To involve the producers in diversified income generating activities, besides the handicrafts, a small Credit Fund was generated in 1981 out of export rebate from buyers and own income of the CORR-The Jute Works. Its aim was to support them with easy credits to carry out such schemes. Money from this fund is loaned to meet the short fall of the scheme budget after utilizing the group savings and the group development fund and is repayable within three years. This fund is available to the producer groups for any productive purpose at 6% service charge, which is usually waived for good repayment. More than 4000 members have borrowed from this fund since starting in 1982 and gainfully used in raw materials, small trades, crop business, kitchen gardening, calf, goat or pig rearing, poultry, rice/pineapple cultivation, pisciculture etc.